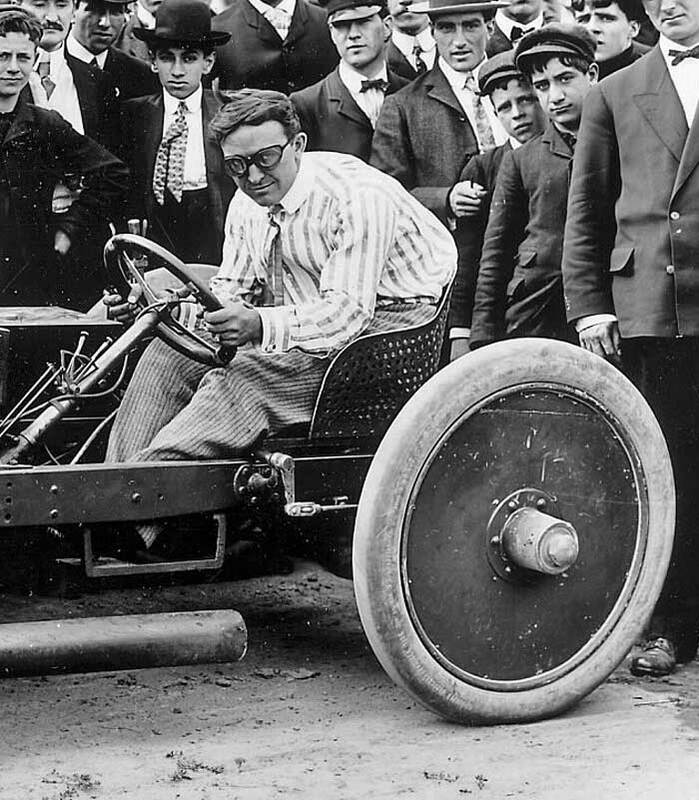 Updated – Barney Oldfield and his exploits with the Peerless Green Dragon Racing car was one of the big news stories on the sports page of the nation’s newspapers in 1904. Oldfield no longer drove Winton’s Racing cars and started driving the first of the three or four Green Dragons. Engineer Louis P. Mooers, who worked for the Peerless Motor Car Company in Cleveland, Ohio, designed the cars. This excellent photo above from the Toronto Public Library was posted recently showing Oldfield with one of the earliest Peerless Green Dragon Racers built. This image has inspired us to research these cars to find out more technical information about them and assemble as many good period photographs of the cars as possible. The first item found about the car in the trade press (above) was published in The Automobile April 4, 1903 issue. The text is somewhat unclear and referrers to only one car (The machine) driven both by Oldfield and Mooers. It seems to indicate that both the Gordon Bennett Race car and Oldfield’s car were of the same type and referred to as Green Dragons. Another likely possibility is two of the 60-h.p. cars were initially built. We do know that a car was at the Gordon Bennett Race held in Ireland on July 2, 1903. 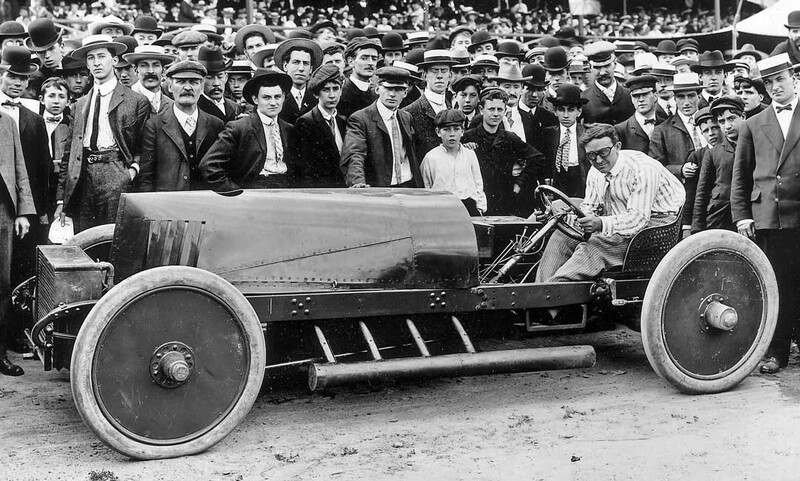 Oldfield is also reported to have started driving his car at about the same time midway through the year in the U.S. Hopefully when we get farther into the story more will be learned about these early cars. 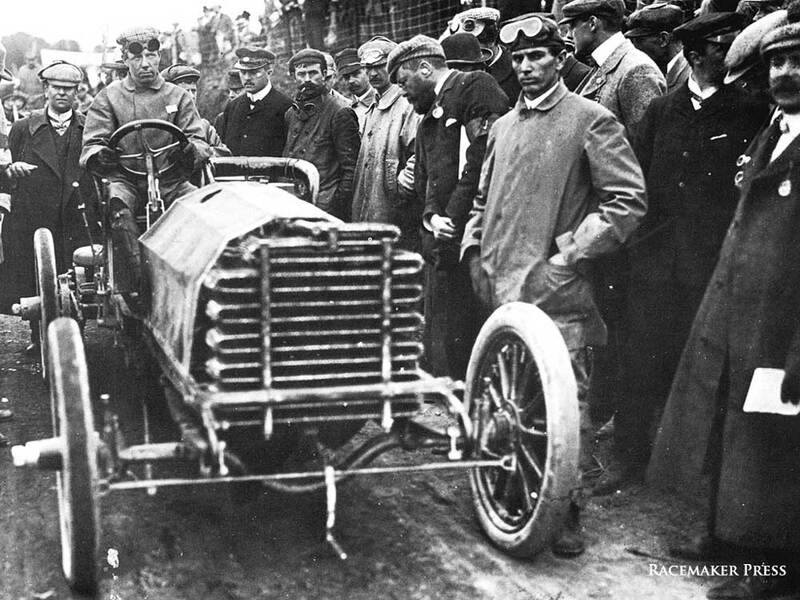 L.P. Mooers with the Peerless at the Gordon Bennett Race held on July 2, 1903 in Ireland. The two photos above from the Peter Helck Collection courtesy of Racemaker Press, show L.P. Mooers at the starting point of the Gordon Bennett Race, and out on the course. In the race the car went out early with overheating problems. This set of images does show that the Gordon Bennett car had a different frame (narrower section and widens in the center) than the car seen with Oldfield above. We will be back with more of the continuing story of the Peerless Racing cars soon. In the meantime enjoy one of the best photos of an early Green Dragon Racer at the top of the post and the enlargements of it below. If you can add any information or good photos to the Green Dragon story, please send us a comment. This entry was posted in Auto Racing 1894 - 1942 and tagged Barney Oldfield, Gordon Bennett Peerless Race car, Gordon Bennett Race, Peerless Green Dragon. That’s gotta be the most uncomfortable driving position I’ve ever seen. He also doesn’t seem to care about tire pressure. The driving position does look both uncomfortable and inefficient. Perhaps it was an attempt at aerodynamics by getting the driver out of the wind? The radiators show a rapid advance in technology both in design and smaller size allowing the pointed front end. Is this the first attempt at swiss cheese on a race car? Look at the seat. I can’t think of an earlier example. Are there any film interviews with Barney Oldfield ? Francis, We have only seen a short clip of him getting out of the Golden Submarine. I love these old photos ! You can really spend some time just studying them. Thanks to all who contribute and those who make this site possible !!!! A lot more detail about the American entries (1 Peerless and 2 Wintons thet were quickly christened “flying bedsteds”), their drivers and lack of success in the Gordon Bennett race can be found in the book “Triumph of the Red Devil” by Brendan Lynch (Portobello Publishing 2002: the red devil was winner Camille Jenatzy driving a 60 hp Mercedes). Possibly the man in racing gear standing beside the Peerless at the Gordon Bennet start was W H Starin, Mooers’s riding mechanic. Mooers was reported to have the Stars and Stripes pinned over his heart – presumably that is the small light coloured patch visible on his chest. Mooers’s two team mates in the Wintons were Percy Owen and Alexander Winton. They all drove on Goodrich tires reported to be very similar to British Dunlops. The Peerless was overweight and had to shed tool box and silencer, making the car very noisy. In the race it was reported to have suffered from great difficulty in re-starting (leading to an hour’s delay on the first lap) as well as overheating ; and it was eventually eliminated when one of the front tires fell off on a corner leading to a crash that damaged a front wheel. I thought there was more information like this on the different Peerless racers on an earlier post here but I couldn’t find it? 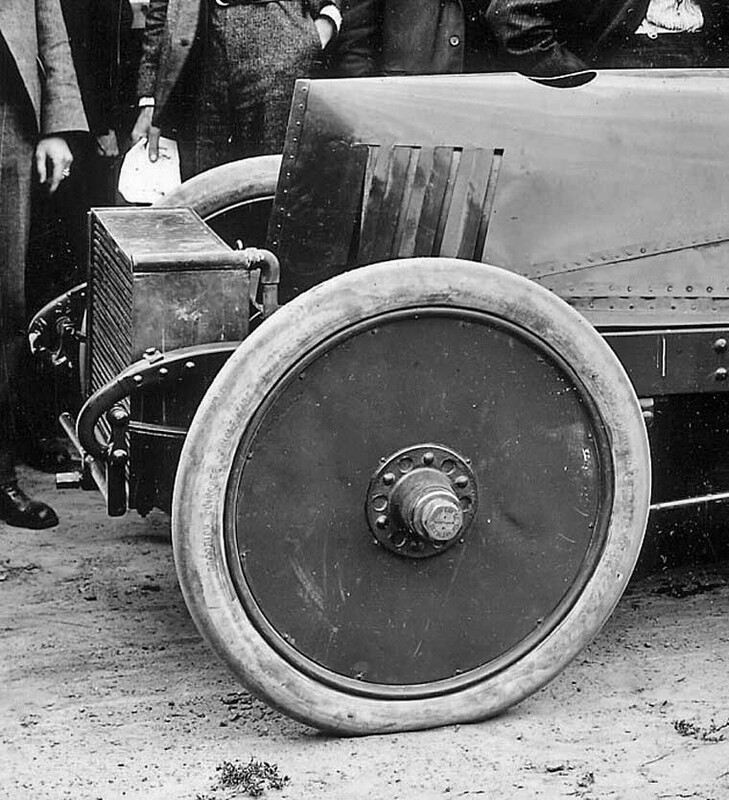 The first two Peerless race cars were two completely different and the first being completed in the fall of 1902 having a 4 cylinder of about 380 cu inches and wheelbase about 100 inches? The second finished in 1903 and 4 cyl about 700 cu inches and wheelbase a foot or so longer. Two totally different and visually distinguishable by very different radiators, and also much larger cast rear wheel centers on the larger due to a very unique for the time drive setup. Ball bearings most everywhere on the second car. The smaller had a chain drive (IIRC). Both originally had artillery wheels. Pretty sure the one with disc wheels is at least # 3 in the series but I can’t be sure which car is which in the pictures above without looking a t material I don’t have handy right now. Don’t feel like rehashing something already covered here, so is this the type info you are looking for? If it was covered here please post a link . Looking forward to more posts, especially photos, about Barney and the Green Dragon. Barney has many connections to Salt Lake City both from his bicycling days as well as his auto racing career. He stopped here in SLC 1904 for a series of exhibition runs and several match races against his old ride, the Ford 999 which lived here for a short time. I have wanted to pin down accurate specs on the various Green Dragons such as WB, Track and tire size. I have always wanted to do a sketch of one. Thanks David. AHhhh! the old Swiss Cheese on the seat trick! : 1. I can see a lot MORE places for MORE “Swiss Cheese”. 2. Please note the “SWISS CHEESE” at the FRONT of the Header / Collector pipe: This was said to have a “Free for nothing scavenging / supercharging effect” — at high speeds. 3. Many Early Steam , Diesel ,Kerosene & Gasoline powered Tractors and other commecial types of vehicles & machinery Also have “Swiss Cheesed” Seats! I SEE that this car’s overheating radiator finally gave way to the common sense of All rows Being more equally in the breeze, by many more smaller parallel tubes that were also staggered and WAY more fin area, plus, ( later on) the addition of small louvers on the fins for additional heat transfer. NO water pump, (thermo-syphon) or water that was pumped SO FAST that it couldn’t transfer heat before re-entering the block, — were lessons that were learned ALONG THE WAY, by those who pushed their early vehicles to higher & higher performance levels. AT FULL SPEED (RACING) or fully overloaded climbing a grade (TRUCKS), — there IS a commonality in these extremes, that requires a mixture rich enough to COOL the combustion chamber for safe performance. The radiator cannot be blamed for mixture, choice of good high speed breathing, (inlet OR exhaust), spark plug, good compression, or ignition timing, to name a FEW. Edwin. To Mr. Brown. I have many reference photos of the Peerless in the Price Museum of Speed here in Salt Lake. It would make an interesting profile sketch. However, I have also read several accounts as to how this car came into being and it makes me wonder just how much Dragon there actually is in it. What I like to work from are period images. 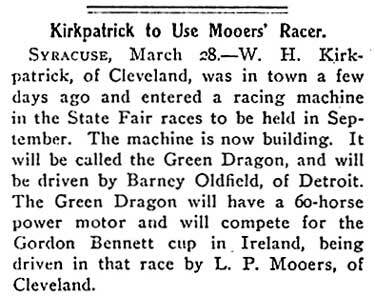 About all I know about Barney’s appearance in SLC in late 1904 was that the Green Dragon he drove was under-slung. That rules out the museum car. 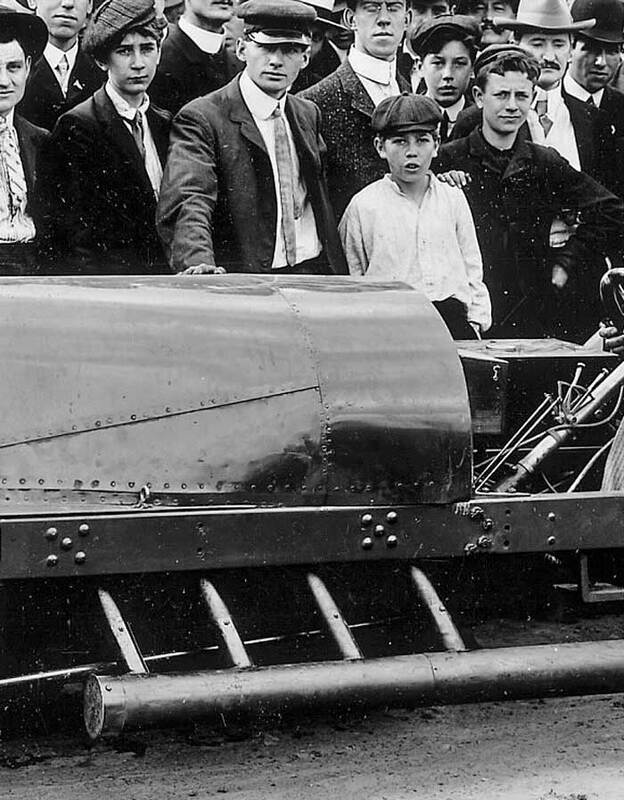 The car Oldfield raced on his Barn Storming in SLC was not 999. It was another PEERLESS that traveled with them. Barney WON ever time they raced. Other car was called the Blue Streak which was the Mfg. name of the bicycle that Barney road when he was racing bicycles. THINK THAT BARNEY NAMED IT ? Mr. Keating – You are correct and I was not clear. 999 was in Salt Lake for a period of time in late 1904. It was being campaigned by Will Pickens with driver Jed Newkirk. But 999, it seems, was broken down more than it was running and frustrated Newkirk quit and returned to New York to race bicycles, leaving Pickens stranded in Salt Lake with no driver. Enter local sport and chauffeur Bert Fuller, driver for wealthy Utah mining magnate Samuel Newhouse. Pickens offered Fuller the unenviable job driving the 999 and he promptly leveled at E. A. Moross (Oldfield’s manger, who just happened to be in town) a challenge for a match race between 999 and the Green Dragon. Oldfield was in Denver at the time, heading to the coast, and a series of races and the anticipated match race were arranged, with much publicity, of course. On the day of the race, with a large crowd present, 999 blew a cylinder before the race even started and was out. Being a good sport, Oldfield entertained the now surly crowd with a speed exhibition in the Dragon. Everyone went home happy with a rain-check for admission to a rescheduled match race for the following weekend. Meanwhile, Pickens and Fuller worked mightily to get 999 repaired. But on the day of the rescheduled race, and with another large crowd present, 999 refused to start resulting in more grumpy spectators. Again, Oldfield obliged with another exhibition run in the Green Dragon. The next day he and Moross departed for Reno. Pickens and Fuller continued to work on 999 without much success. The car was eventually shipped to Los Angeles for repairs, but as the story goes, no one claimed it and it was eventually sold as freight salvage. I liked your article on the Green Dragon. For more information go to our web page Peerless Motor Car Club and look under racing with Peerless.